Background: Adalimumab induced clinical remission after four weeks in patients with active Crohn’s disease in the CLASSIC I trial. 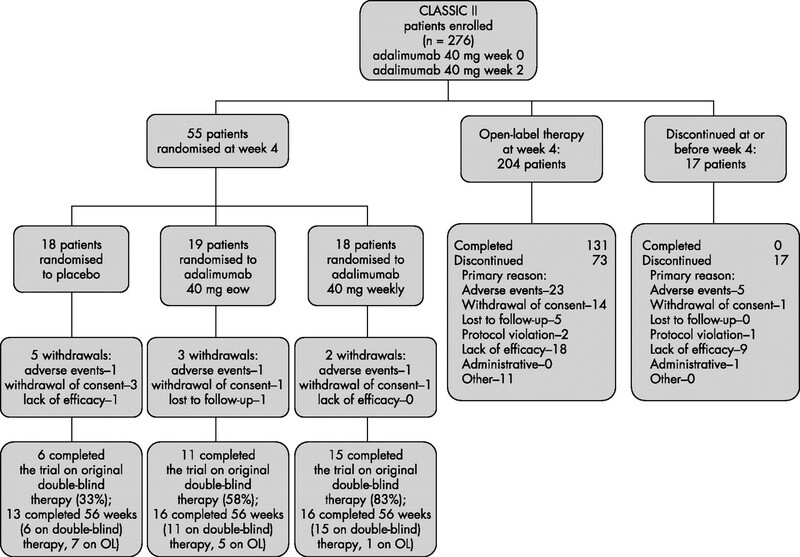 Objective: To evaluate long term efficacy and safety of adalimumab maintenance therapy in Crohn’s disease in a follow-on randomised controlled trial (CLASSIC II). Methods: In the preceding CLASSIC I trial, 299 patients with moderate to severe Crohn’s disease naive to tumour necrosis factor antagonists received induction therapy with adalimumab 40 mg/20 mg, 80 mg/40 mg, or 160 mg/80 mg, or placebo, at weeks 0 and 2. In all, 276 patients from CLASSIC I enrolled in CLASSIC II and received open-label adalimumab 40 mg at weeks 0 (week 4 of CLASSIC I) and 2; 55 patients in remission at both weeks 0 and 4 were re-randomised to adalimumab 40 mg every other week, 40 mg weekly, or placebo for 56 weeks. Patients not in remission at both weeks 0 and 4 were enrolled in an open-label arm and received adalimumab 40 mg every other week. With non-response or flare, these patients could have their dosages increased to 40 mg weekly. Patients in the randomised arm with continued non-response or disease flare could switch to open-label adalimumab 40 mg every other week and again to 40 mg weekly. The primary end point was maintenance of remission (CDAI <150) in randomised patients through week 56. Results: Of 55 patients randomised at week 4, 79% who received adalimumab 40 mg every other week and 83% who received 40 mg weekly were in remission at week 56, v 44% for placebo (p<0.05). In all, 204 patients entered the open-label arm. Of these, 93 (46%) were in clinical remission at week 56. Adalimumab was generally well-tolerated in all patients. Conclusions: Adalimumab induced and maintained clinical remission for up to 56 weeks in patients with moderate to severe Crohn’s disease naive to anti-TNF treatment. The predefined hypothesis of this study was that sustained adalimumab treatment would maintain long-term clinical remission in a larger proportion of patients with moderate to severe Crohn’s disease than would placebo. In CLASSIC II, patients who achieved remission after the four-week induction regimen in CLASSIC I and then maintained remission for an additional four weeks with open-label adalimumab 40 mg every other week were re-randomised to receive blinded adalimumab treatment or placebo for 56 weeks. Patients not in remission at both weeks 0 and 4 of CLASSIC II entered the open-label arm and received adalimumab 40 mg every other week, with the potential to have their dosages increased to 40 mg weekly with non-response or disease flare. This multicentre, randomised, double-blind, placebo-controlled trial was conducted at 53 centres between 28 August 2002 and 12 January 2005. The protocol was approved by the institutional review board or ethics committee at each centre. All patients provided written informed consent. All patients who met study entry criteria and successfully completed CLASSIC I26 were eligible to enrol in CLASSIC II. Female patients of childbearing potential were required to use a highly effective form of birth control, and all patients were required to demonstrate adequate cardiac, renal, and hepatic function as determined by the principal investigator. In the CLASSIC I trial, patients were randomly assigned to receive one of the following subcutaneous induction regimens: placebo at weeks 0 and 2; adalimumab 40 mg at week 0 and 20 mg at week 2; adalimumab 80 mg at week 0 and 40 mg at week 2; or adalimumab 160 mg at week 0 and 80 mg at week 2. Clinical remission was defined as a Clinical Disease Activity Index (CDAI) score of less than 150 points.27 Patients were eligible for enrolment in the randomised cohort of CLASSIC II if they were in clinical remission at both week 0 (week 4 in CLASSIC I) and week 4. At week 4, those in remission were randomly assigned in a 1:1:1 ratio to receive blinded subcutaneous maintenance treatment with adalimumab 40 mg every other week, adalimumab 40 mg weekly, or placebo from weeks 4 to 55. Patients not in remission at both time points entered the open-label cohort and received 40 mg every other week. All patients were followed to the end of week 56. Assignment to randomised treatment was done centrally. A pharmacist or designee dispensed the study drug according to detailed instructions provided by Abbott Laboratories to each of the study sites. Dosages employed in this study were selected on the basis of pharmacokinetic data from clinical trials of adalimumab in patients with rheumatoid arthritis. Adalimumab serum concentrations of 4–8 μg/ml achieved with dosages of 40 mg every other week were found to be effective in rheumatoid arthritis. On this basis, a dosage of 40 mg of adalimumab every other week was selected as the target maintenance dosage for efficacy in Crohn’s disease. An additional dosage, 40 mg weekly, was also included. This 40 mg weekly dosage was expected to yield adalimumab concentrations slightly greater than 10 μg/ml. If randomised patients experienced a flare (defined as both an increase in CDAI to ⩾70 points above the CLASSIC II week-4 value and a total CDAI score of >220 points) or had continued non-response (defined as a decrease in CDAI ⩽70 points v week-0 value in CLASSIC I), they were permitted to switch to open-label adalimumab 40 mg every other week. These patients were considered failures in the primary efficacy analysis. If patients receiving open-label adalimumab 40 mg every other week flared or had continued non-response, their dosages could be increased to 40 mg weekly. Patients on weekly open-label dosing who continued to flare were discontinued from the study. For the randomised cohort, the patients, study coordinators, and study investigators were all blinded to treatment assignments. Patients’ dosages of all concurrent drugs were required to remain constant, with the exception of corticosteroids. Steroid tapering was mandated for randomised patients at week 8 and was permitted in the open-label cohort for those patients who were responders (that is, who experienced a reduction of ⩾70 points in CDAI score from week 0 in CLASSIC I). After week 8, daily doses for randomised patients receiving prednisone >10 mg were reduced by 5 mg weekly until a dosage of 10 mg/day was reached. Thereafter, dosage was reduced by 2.5 mg weekly to the point of discontinuation. Similarly, budesonide dosage was decreased by 3 mg every week until discontinuation. Remission was defined as a CDAI <150 points.27 Response was defined as a reduction of ⩾70 points (70-point response) or of ⩾100 points (100-point response) in the CDAI score from week 0 in CLASSIC I. Patients were assessed at weeks 0, 2, 4, 8, 12, 16, 20, 24, 32, 40, 48, and 56, and CDAI scores were calculated for each visit. CDAI scores range from 0 to 600, with greater scores indicating greater disease activity. The inflammatory bowel disease questionnaire (IBDQ)28 was administered to assess patient-reported outcomes at each visit. IBDQ total scores range from 32 to 224, with greater scores indicating better patient function and quality of life. At each visit, adverse events and concomitant drug treatments were recorded, and samples were collected for standard laboratory evaluations, including antibodies to adalimumab as well as C-reactive protein values. Safety assessments included vital signs, physical examination, haematology, serum biochemistry, and urinalysis. Sample size calculations for the lead-in CLASSIC I study, which called for enrolment of at least 300 patients, have been published.26 All patients who completed CLASSIC I were eligible to participate in CLASSIC II, and no additional statistical powering for this follow-on study was conducted. Thus, the analyses described here were exploratory. It was anticipated that approximately 90% of the patients from CLASSIC I (270 patients) would enrol. The primary analysis using Pearson’s χ2 test evaluated the proportion of patients in remission at week 56 in each arm of the randomised cohort (adalimumb 40 mg every other week, adalimumb 40 mg weekly, and placebo). Those with missing primary end point data at week 56 or those who had moved to open-label dosing were classified in a “no maintenance of remission” category. An initial overall comparison of the three treatment groups (adalimumab 40 mg every other week, adalimumab 40 mg weekly, and placebo) was tested. If significant differences between the three groups were detected, pairwise comparisons of each adalimumab group v the placebo group were conducted. The Pearson’s χ2 test, Fisher’s exact test, analysis of co-variance (ANCOVA), the Kruskal–Wallis test, and Kaplan–Meier survival analysis were used as appropriate to provide nominal p values for secondary end points. Prespecified secondary analyses included the percentages of patients in remission at week 24; 70-point and 100-point clinical responses at weeks 24 and 56; changes in IBDQ total score from baseline to weeks 24 and 56; and percentages of patients who completely discontinued steroids without loss of remission at weeks 24 and 56. A subgroup efficacy analysis of patients receiving and not receiving concomitant immunosuppressive agents was also conducted. All secondary analyses were carried out using last observation carried forward (LOCF). Analyses of the results for patients who received open-label treatment were imputed, and patients who discontinued treatment before week 56 were counted as primary treatment failures. In all, 276 patients participated in the study. Fifty-five had achieved remission at weeks 0 and 4 and were randomised (fig 1). In this 55-patient randomised cohort, 18 patients received placebo, 19 received adalimumab 40 mg every other week, and 18 received adalimumab 40 mg weekly. The baseline characteristics of the randomised patients who received placebo were similar to those who received adalimumab (table 1). In the randomised group, five patients (28%) withdrew prematurely from the placebo group, v three patients (16%) in the adalimumab 40 mg every other week group, and two patients (11%) in the adalimumab 40 mg weekly group. Enrolment and treatment of patients in CLASSIC II. eow, every other week; OL, open-label. In all, 204 patients were ineligible for randomisation and began receiving open-label adalimumab 40 mg every other week at week 4. In addition, 17 patients discontinued at or before week 4 for the reasons given in fig 1. Baseline characteristics of patients who received open-label adalimumab were similar to those who were randomised (table 1). In the open-label group, 36% of patients discontinued, 11.3% because of adverse events and 9% because of lack of efficacy (fig 1). All 55 patients were included in the efficacy analyses of the randomised patient group. For the primary analysis at week 56, there was a significant difference in the remission rates between the adalimumab 40-mg every other week group (15/19, 79%), the adalimumab 40-mg weekly group (15/18, 83%), and the placebo group (8/18, 44%) (p<0.05 for each adalimumab group v placebo) (fig 2A). The rates of remission at week 56 were similar for patients receiving concomitant immunosuppressants such as azathioprine, 6-mercaptopurine, or methotrexate (adalimumab 40 mg every other week (4/4, 100%), adalimumab 40 mg weekly (4/5, 80%), and placebo (1/3, 33%)); and patients not receiving concomitant immunosuppressants (adalimumab 40 mg every other week (11/15, 73%), adalimumab 40 mg weekly (11/13, 85%), and placebo (7/15, 47%)). Significant differences in remission and 100-point clinical response compared with placebo were demonstrated as early as week 12 in both adalimumab groups (fig 2, panels A and B). The 70-point clinical response rates were numerically greater for the two active treatment groups v placebo (fig 2C). Efficacy of adalimumab as maintenance treatment in Crohn’s disease in the randomised cohort. Remission was defined as a decrease in the CDAI score of <150 points; 100-point response was defined as a decrease from CLASSIC I baseline in the CDAI score of ⩾100 points; and 70-point response was defined as a decrease from CLASSIC I baseline in the CDAI score of ⩾70 points. Significance was assessed v placebo. (A) The percentage of patients in each adalimumab dose group and the placebo group achieving remission at weeks 4, 8, 12, 16, 24, 32, 40, 48, and 56. *p<0.05 v placebo, last observation carried forward (LOCF) for intention-to-treat (ITT) population, n = 55. (B) The percentage of patients in each adalimumab dosage group and the placebo group achieving a 100-point response at weeks 4, 8, 12, 16, 24, 32, 40, 48, and 56. *p<0.05 for adalimumab every other week v placebo at weeks 12 and 20; p<0.05 for adalimumab weekly v placebo at weeks 12, 24, 32, and 40. LOCF for ITT population, n = 55. (C) The percentage of patients in each adalimumab dosage group and the placebo group achieving a 70-point response at weeks 4, 8, 12, 16, 24, 32, 40, 48, and 56. 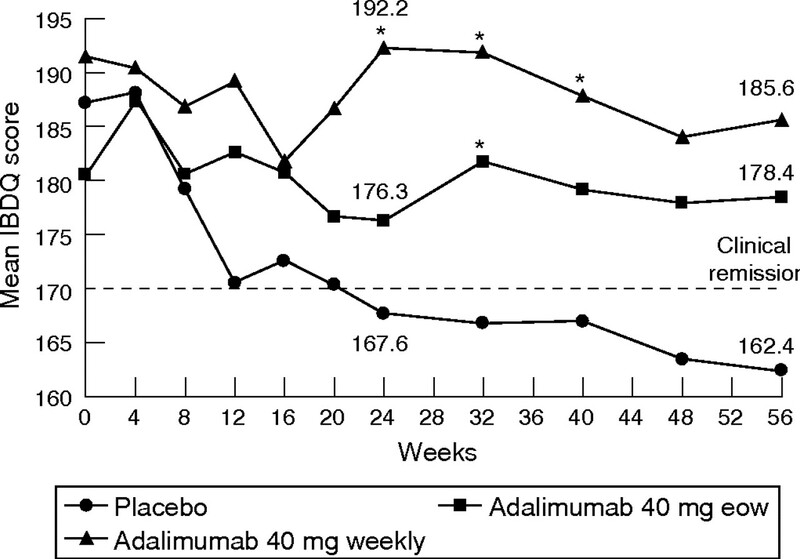 *p<0.05 for adalimumab 40 mg weekly v placebo at week 32. All data are LOCF for ITT population, n = 55. CDAI, Clinical Disease Activity Index; eow, every other week. At week 56, patients in the adalimumab groups had greater mean decreases (improvements) from baseline in CDAI score than patients in the placebo group: 150.8 (95% confidence interval (CI), −202 to −99.8) and 197.7 (−248 to −147) for the every-other-week and weekly groups, respectively, v 119.6 (−174 to −65.1) for placebo (LOCF, p<0.05 for each adalimumab group v placebo). In the randomised group, 49% of patients (27 of 55) were receiving systemic steroids or budesonide at baseline of CLASSIC II. At week 56, 57% (4/7) of the placebo patients had completely discontinued steroids, compared with 67% (4/6) of the patients in the adalimumab 40-mg every other week group and 88% (7/8) in the adalimumab 40-mg weekly group (LOCF). The mean total IBDQ score at the start of CLASSIC II was 186.4. A score ⩾170 corresponds to clinical remission. A mean total IBDQ score of ⩾170 was maintained in the groups of randomised patients treated with adalimumab 40-mg every other week or weekly (fig 3), while IBDQ scores declined rapidly in patients receiving placebo. Median C-reactive protein concentrations (mg/dl (range)) at week 24 were 0.5 (0 to 1.2), 0.4 (0 to 1.9), and 0.1 (0 to 1.6) in the placebo, adalimumab 40 mg every other week, and adalimumab 40-mg weekly groups, respectively. At week 56, these C-reactive protein values were 0.4 (0 to 0.9), 0.3 (0 to 2.8), and 0.3 (0 to 1.2), respectively. Mean total Inflammatory Bowel Disease Questionnaire (IBDQ) scores by visit: randomised cohort of CLASSIC II. Mean total IBDQ scores in each adalimumab dosage group and the placebo group at weeks 4, 8, 12, 16, 24, 32, 40, 48, and 56. IBDQ values ⩾170 correlate with clinical remission. All data are last observation carried forward for the intention-to-treat population, n = 55. *p<0.05 for adalimumab every other week v placebo at week 32; p<0.005 for adalimumab 40 mg weekly v placebo at weeks 24, 32, and 40. eow, every other week. In all, 204 patients who were not in remission at both week 0 and week 4 entered the open-label cohort. Of these, 131 (64%) completed 56 weeks of treatment, 71 remained on their initial regimens of adalimumab 40 mg every other week, and 60 had their dosages increased to 40 mg weekly at some point before week 56. Ninety-three (46%) of the 204 patients receiving open-label adalimumab were in remission at week 56, including 56/115 (49%) of those receiving 40 mg every other week and 37/89 (42%) of those receiving 40 mg weekly. 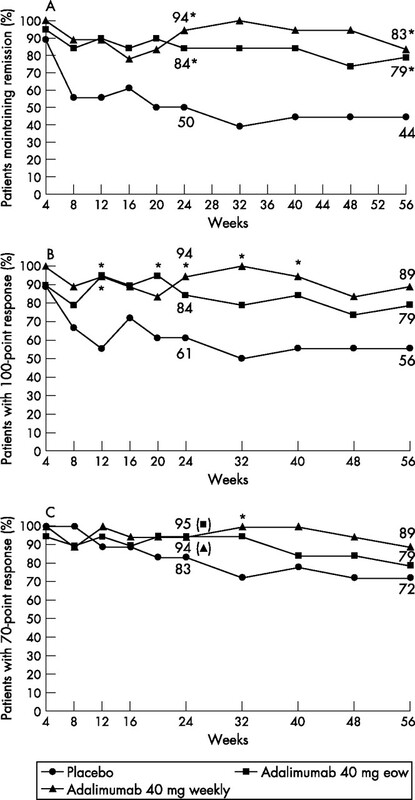 One hundred and thirty-two (65%) of the 204 patients receiving open-label adalimumab achieved a 100-point clinical response at week 56 or last visit, including 73/115 (64%) with 40 mg every other week and 59/89 (66%) with 40 mg weekly (LOCF). Moreover, 147/204 patients receiving open-label adalimumab (72%) achieved a 70-point clinical response at week 56, including 80/115 (70%) with 40 mg every other week and 67/89 (75%) with adalimumab 40 mg weekly. In the open-label cohort, rates of remission and 100-point clinical response (CR-100) at week 56 were similar for patients receiving concomitant immunosuppressants (remission, 48%; CR-100, 68%) and for patients who did not receive concomitant immunosuppressants (remission, 45%; CR-100, 63%). At week 56, patients in the open-label cohort had a mean decrease from baseline in CDAI score of 158.4. In addition, at week 56, 58% of patients receiving steroids at baseline in the open-label cohort (21/36) had discontinued them. The most frequently reported treatment-emergent adverse events (⩾5% of patients) in the total population of CLASSIC II (n = 276) were nasopharyngitis, aggravated Crohn’s disease, and sinusitis (table 2). The most frequently reported infectious adverse events were nasopharyngitis, sinusitis not otherwise specified (NOS), upper respiratory tract infection NOS, and influenza. No cases of tuberculosis, coccidioidomycosis, histoplasmosis, aspergillosis, listeria, pneumocystis, or blastomycosis were reported. One placebo patient reported a malignancy (squamous cell carcinoma). No lymphomas occurred during the study, and no patients died. Also, no events of interest for anti-TNF agents—including demyelinating events, lupus-like reactions, and congestive heart failure—were reported. Injection-site reaction NOS and burning were the most commonly reported of injection-site reactions, none of which led to patient withdrawal. In the randomised cohort, larger percentages of patients randomised to placebo experienced adverse events, serious adverse events, severe adverse events, and adverse events leading to discontinuation than did patients randomised to either dosage of adalimumab. Blood concentrations of both adalimumab and antibodies to adalimumab were collected for 269 of the 276 patients in CLASSIC II. Of these 269, seven (2.6%) were determined to have developed antibodies to adalimumab. Of the 269, 84 received concomitant immunosuppressants, none of whom were positive for antibodies to adalimumab. Seven of the 185 patients (3.8%) who developed the antibodies did not receive concomitant immunosuppressants. Further, three of the seven patients positive for antibodies to adalimumab (43%) were in remission at week 24, and two of seven (29%) were in remission at week 56. One hundred and eighty-five patients had both baseline and week 56 (or last visit) measurements for antinuclear antibodies (ANA). Of these, 172 were determined to be ANA-negative at baseline, and 33/172 (19%) were ANA-positive at their final visits. Further, all 33 were positive for antibodies to double-stranded DNA (dsDNA), also at their final visits. Of the 13/185 patients determined to be positive for ANAs at baseline, 4/13 (31%) were ANA-negative at their final visits, and all of these were negative for antibodies to dsDNA at baseline. Overall, there were no significant findings of clinical laboratory abnormalities, including concentrations of ANAs, and there were no correlations between laboratory findings and clinical efficacy. The results of this study support the efficacy of adalimumab given subcutaneously at a dosage of 40 mg every other week or weekly versus placebo for inducing and maintaining remission in infliximab-naive Crohn’s disease patients with moderate to severe disease activity. Of the randomised patients, those who received adalimumab were approximately 1.5–2.0 times more likely to have maintained remission at 56 weeks. Consistent with these results, randomised patients who received either dosage of adalimumab also had numerically greater rates of 100-point and 70-point responses, and lower disease activity as measured by mean CDAI scores and mean IBDQ total scores, compared with patients who received placebo. However, this study was not powered to detect statistical differences in these measures, and there were relatively small numbers of patients (<20) in each of the three groups of the randomised cohort. Furthermore, the majority of randomised patients in the adalimumab treatment groups and in the open-label cohort who were receiving corticosteroids at baseline of CLASSIC I were without relapse and steroid-free at week 56. The relatively small number of patients in the randomised cohort receiving steroids at baseline and the open-label nature of the other cohort did not permit statistical comparison. Statistically significant differences in remission and in 100-point clinical response could be observed as early as week 12 (eight weeks after randomisation) v placebo. In addition, while remission rates were similar between randomised patients receiving concomitant immunosuppressants and patients who did not receive concomitant immunosuppressants, the relatively small sample size of the randomised group, as well as the lack of a placebo control in the open-label group, preclude definitive conclusions on the clinical efficacy of concomitant immunosuppression. Patients who had not achieved remission at both weeks 0 and 4 and entered the open-label cohort represent a more difficult to treat population. Adalimumab therapy resulted in progressive increases in clinical remission at week 56 for 46% of these patients. Moreover, approximately two-thirds of patients who received adalimumab open-label therapy achieved 100-point improvement in CDAI at week 56, and close to three-quarters achieved a 70-point improvement. Again, response rates were similar between patients who received concomitant immunosuppressants and those who did not. The results of maintenance treatment with the fully human, IgG1 monoclonal antibody adalimumab in patients with Crohn’s disease presented here are broadly similar to those reported for the chimeric IgG1 monoclonal antibody infliximab and for the humanised Fab′ antibody fragment conjugated to polyethylene glycol, certolizumab pegol (CDP-870).8,9,29 Infliximab, certolizumab pegol, and adalimumab have each shown efficacy for maintenance of remission in patients with moderately to severely active Crohn’s disease who had previously responded to induction treatment with the same agent (drug withdrawal study design). However, while there are one-year maintenance data for adalimumab and infliximab, published data for certolizumab pegol cover six-month analyses only. In contrast, another anti-TNF therapy—the humanised IgG4 monoclonal antibody, CDP-571—failed to show efficacy for induction of remission at 24 to 26 weeks.30,31 These differences in efficacy between anti-TNF antibodies may at least partially be related to study design. Adalimumab offers a patient advantage over other biological agents for Crohn’s disease in that it can be self-administered through subcutaneous injection with either a prefilled syringe or an autoinjection pen. There was an apparent dosage response across the two randomised adalimumab groups for the end points of remission and the 100-point response at week 56, but no clinically important difference in dosage response was observed between the two maintenance regimens. With either dosage, remission rates were significantly greater than for placebo at most time points after week 12. For induction of remission, results of CLASSIC I suggested that a loading dose of adalimumab 160 mg at week 0 followed by 80 mg at week 2 (resulting in blood concentrations at week 4 equivalent to 40-mg weekly dosing) is the optimal induction dose. For maintenance of remission, the results of CLASSIC II suggest that both 40 mg every other week and adalimumab weekly are effective. More conclusively, the results from a large maintenance trial comparing adalimumab 40 mg every other week, adalimumab 40 mg weekly, and placebo (the CHARM study)32 showed that adalimumab every other week and adalimumab weekly are equally effective in maintaining remission in patients with Crohn’s disease. Maintenance treatment with adalimumab was generally well-tolerated. The rates of serious adverse events were low in patients treated with adalimumab and were similar to placebo. No patients developed serious infectious adverse events, opportunistic infections, tuberculosis, lupus, demyelinating neurological diseases, or lymphoma; and no patients died. The percentage of patients developing antibodies to the human antibody adalimumab was low (7/269, 2.6%). It should be acknowledged that this small study lacked adequate statistical power to estimate accurately how often antibodies developed to adalimumab compared with placebo, or to explore whether concomitant immunosuppression with azathioprine, 6-mercaptopurine, or methotrexate was protective. However, the results for the total number of patients exposed to adalimumab show that the immunogenicity of adalimumab in patients with Crohn’s disease is modest. In patients with rheumatoid arthritis, the rate of formation of antibodies to adalimumab was 5% (1% for patients receiving concomitant treatment with methotrexate and 12% for patients receiving adalimumab monotherapy).33 The rate of ANA formation observed in CLASSIC II was consistent with what has been observed in controlled and open-label trials of adalimumab in rheumatoid arthritis (data on file and33) As noted, there were no significant findings of clinical laboratory abnormalities, and there were no correlations between laboratory findings and clinical efficacy. Subcutaneous administration of adalimumab resulted in maintenance of remission and response, potential steroid sparing effects, and improved quality of life over one year in infliximab-naive Crohn’s disease patients with moderate to severe disease activity compared with placebo. Both 40-mg every other week and 40-mg weekly dosages were effective. In this trial, adalimumab was generally well-tolerated. Adalimumab represents an important new therapeutic option for the treatment of Crohn’s disease. We thank Kathleen Lomax, MD, of Abbott Laboratories for her input and feedback on the development and revision of this manuscript; Jianhua Zhong PhD, also of Abbott, for his assistance with data acquisition and management; and Michael A Nissen, ELS, Abbott, for his editorial assistance in the development and revision of this paper. Romagnani S. Th1/Th2 cells. Inflamm Bowel Dis1999;5:285–94. Murch S H, Lamkin V A, Savage M O, et al. Serum concentrations of tumour necrosis factor alpha in childhood chronic inflammatory bowel disease. Gut1991;32:913–17. Braegger C P, Nicholls S, Murch S H, et al. Tumour necrosis factor alpha in stool as a marker of intestinal inflammation. Lancet1992;339:89–91. Murch S H, Braegger C P, Walker-Smith J A, et al. Location of tumour necrosis factor alpha by immunohistochemistry in chronic inflammatory bowel disease. Gut1993;34:1705–9. Van Deventer S J. Tumour necrosis factor and Crohn’s disease. Gut1997;40:443–8. Papadakis K A, Targan S R. Tumor necrosis factor: biology and therapeutic inhibitors. Gastroenterology2000;119:1148–57. Targan S R, Hanauer S B, van Deventer S J, et al. A short-term study of chimeric monoclonal antibody cA2 to tumor necrosis factor alpha for Crohn’s disease. Crohn’s Disease cA2 Study Group. N Engl J Med1997;337:1029–35. Rutgeerts P, D’Haens G, Targan S, et al. Efficacy and safety of retreatment with anti-tumor necrosis factor antibody (infliximab) to maintain remission in Crohn’s disease. Gastroenterology1999;117:761–9. Hanauer S B, Feagan B G, Lichtenstein G R, et al. Maintenance infliximab for Crohn’s disease: the ACCENT I randomised trial. Lancet2002;359:1541–9. DH, Rutgeerts P, Targan S. et al Infliximab for the treatment of fistulas in patients with Crohn’s disease. N Engl J Med1999;340:1398–405. BE, Anderson F H, Bernstein C N. et al Infliximab maintenance therapy for fistulizing Crohn’s disease. N Engl J Med2004;350:876–85. Baert F, Noman M, Vermeire S, et al. Influence of immunogenicity on the long-term efficacy of infliximab in Crohn’s disease. N Engl J Med2003;348:601–8. Farrell R J, Alsahli M, Jeen Y T, et al. Intravenous hydrocortisone premedication reduces antibodies to infliximab in Crohn’s disease: a randomized controlled trial. Gastroenterology2003;124:917–24. Hanauer S B, Wagner C L, Bala M, et al. Incidence and importance of antibody responses to infliximab after maintenance or episodic treatment in Crohn’s disease. Clin Gastroenterol Hepatol2004;2:542–53. Cheifetz A, Smedley M, Martin S, et al. The incidence and management of infusion reactions to infliximab: a large center experience. Am J Gastroenerol2003;98:1315–24. Hanauer S, Rutgeerts P, Targan S, et al. Delayed hypersensitivity to infliximab (Remicade) re-infusion after a 2–4 year interval without treatment [abstract]. Gastroenterology1999;116:A731. Breedveld F C. Therapeutic monoclonal antibodies. Lancet2000;355:735–40. den Broeder A, van de Putte L, Rau R, et al. A single dose, placebo controlled study of the fully human anti-tumor necrosis factor-alpha antibody adalimumab (D2E7) in patients with rheumatoid arthritis. J Rheumatol2002;29:2288–98. van de Putte L B, Rau R, Breedveld F C, et al. Efficacy and safety of the fully human anti-tumour necrosis factor alpha monoclonal antibody adalimumab (D2E7) in DMARD refractory patients with rheumatoid arthritis: a 12 week, phase II study. Ann Rheum Dis2003;62:1168–77. Weinblatt M E, Keystone E C, Furst D E, et al. Adalimumab, a fully human anti-tumor necrosis factor alpha monoclonal antibody, for the treatment of rheumatoid arthritis in patients taking concomitant methotrexate: the ARMADA trial. Arthritis Rheum2003;48:35–45. Weisman M H, Moreland L W, Furst D E, et al. Efficacy, pharmacokinetic, and safety assessment of adalimumab, a fully human anti-tumor necrosis factor-alpha monoclonal antibody, in adults with rheumatoid arthritis receiving concomitant methotrexate: a pilot study. Clin Ther2003;25:1700–21. Furst D E, Schiff M H, Fleischmann R M, et al. Adalimumab, a fully human anti tumor necrosis factor-alpha monoclonal antibody, and concomitant standard antirheumatic therapy for the treatment of rheumatoid arthritis: results of STAR (Safety Trial of Adalimumab in Rheumatoid Arthritis). J Rheumatol2003;30:2563–71. van de Putte L B, Atkins C, Malaise M, et al. Efficacy and safety of adalimumab as monotherapy in patients with rheumatoid arthritis for whom previous disease modifying antirheumatic drug treatment has failed. Ann Rheum Dis2004;63:508–16. Keystone E C, Kavanaugh A F, Sharp J T, et al. Radiographic, clinical, and functional outcomes of treatment with adalimumab (a human anti-tumor necrosis factor monoclonal antibody) in patients with active rheumatoid arthritis receiving concomitant methotrexate therapy: a randomized, placebo-controlled, 52-week trial. Arthritis Rheum 2004;50:1400–11. Rau R, Simianer S, van Riel P L, et al. Rapid alleviation of signs and symptoms of rheumatoid arthritis with intravenous or subcutaneous administration of adalimumab in combination with methotrexate. Scand J Rheumatol2004;33:145–53. Hanauer S B, Sandborn W J, Rutgeerts P, et al. Human anti-tumor necrosis factor monoclonal antibody (adalimumab) in Crohn’s disease: the CLASSIC I trial. Gastroenterology2006;130:323–33. Best W R, Becktel J M, Singleton J W, et al. Development of a Crohn’s disease activity index. National Cooperative Crohn’s Disease Study. Gastroenterology1976;70:439–44. Irvine E J, Feagan B, Rochon J, et al. Quality of life: a valid and reliable measure of therapeutic efficacy in the treatment of inflammatory bowel disease. Canadian Crohn’s Relapse Prevention Trial Study Group. Gastroenterology1994;106:287–96. Schreiber S, Khaliq-Kareemi M, Lawrance I, et al. Certolizumab pegol, a humanised anti-TNF pegylated FAb′ fragment, is safe and effective in the maintenance of response and remission following induction in active Crohn’s disease: a phase III study (Precise). Gut2005;54 (suppl VII) :A82. Sandborn W J, Feagan B G, Hanauer S B, et al. An engineered human antibody to TNF (CDP571) for active Crohn’s disease: a randomized double-blind placebo-controlled trial. Gastroenterology2001;120:1330–8. Sandborn W J, Feagan B G, Radford-Smith G, et al. CDP571, a humanised monoclonal antibody to tumour necrosis factor alpha, for moderate to severe Crohn’s disease: a randomised, double-blind, placebo-controlled trial. Gut2004;53:1485–93. Colombel J, Sandborn W J, Rutgeerts P, et al. Adalimumab for maintenance of clinical response and remission in patients with Crohn’s disease: the CHARM Trial. Gastroenterology2007;132:52–65. Abbott Laboratories. Prescribing information for HUMIRA® (adalimumab). Chicago: Abbott Laboratories, February 2007. William Sandborn, Paul Rutgeerts, Douglas Wolf, and Remo Panaccione have served as consultants for Abbott Laboratories. William Sandborn, Stephen Hanauer, Paul Rutgeerts, and Remo Panaccione have participated in continuing medical education events supported by unrestricted educational grants from Abbott Laboratories. Jeffrey Kent, Barry Bittle, Ju Li, and Paul Pollack are Abbott employees. Funding: This study was funded by a research grant from Abbott Laboratories, Abbott Park, Illinois, USA. It was designed by two of the investigators who are authors of this manuscript (WJS, SBH), as well as Abbott Laboratories staff members. Selected investigators and Abbott staff members, including those who designed the study, analysed, and interpreted the data, wrote this manuscript, and agreed to submit this manuscript for publication. All authors, including the principal investigator (WJS), approved the content of the manuscript prior to submission.